Spotify has now launched a new set of tools for artists, managers and others to track the popularity of their content on the service. The company is largely focused on communicating to the music industry that its service is a good thing for artists and that any bad stigma surrounding music streaming as a whole is unfounded. The tools are accompanied by some info laying out the royalties Spotify pays to musicians and the various benefits it provides to artists over competing services. 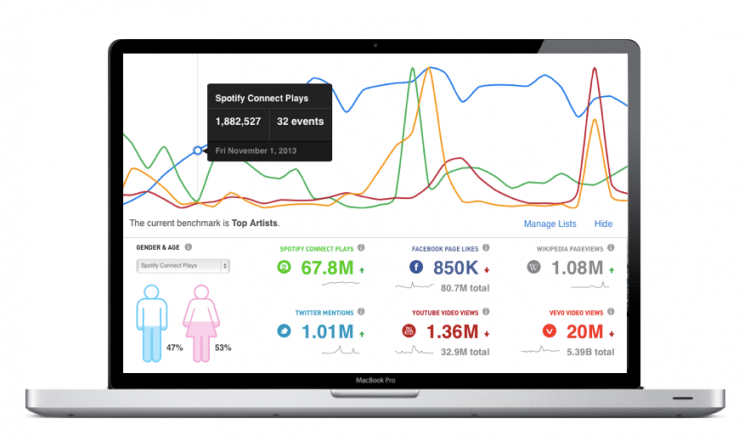 The analytics dashboard gives artists a real-time look at how often their content is being listened to, along with demographic details like age, gender, and location of listeners. Its not unlike similar tools found on other music related sites, and is likely more to do with expanding the toolset available while attempting to stimulate artist confidence in its service. To further that level of confidence, an accompanying site lays out various stats on how royalties are paid out at Spotify, along with other avenues in which the service further exposes artists to the public. Spotify pays "more than two times more" than ad supported service like Youtube and "significantly" more than traditional and online radio services, according to the company. Spotify currently takes a 30% cut, leaving the remaining 70% to the rights holders. The big question is what this means for artists. As an example, Spotify says that all US streaming royalties come to about $503 million annually, but if all of that streaming happened on Spotify, the number would look more like $1.3 billion. The site goes on to talk about how Spotify combats piracy and exposes artists through it merchandising and concert programs. For more information on the various benefits the company is highlighting head over to the site now. Artist looking to get in on the analytics action can head over to Next Big Sounds.